Ultimate convenience! No need for those busy transfer buses. Drop your car at the Short Term car park near the terminal and it will be parked for you while you stroll to check-in. 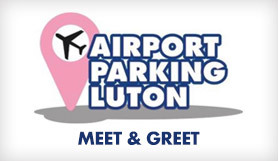 Meet and Greet Airport Parking is becoming an extremely ‘in demand’ and popular service in the United Kingdom and Looking4Parking is pleased to offer Swift Airport Parking’s meet & greet services. Meet and greet parking is the most convenient and cost effective way to start your trip hassle free. The way it works is that you are met very close to the terminal entrance in the short stay designated meet & greet area by an official Swift representative. They quickly inspect your car for any pre-existing damage and scratches and make a note of it on their collection form. Then your car is transported to the nearby fully secure car park and safely parked up and stored for you. You are then left free to take the very short stroll across to the terminal to check in and relax. Whilst your away your car will be kept save in Smart Parking's secure car park with 24 hour security, CCTV, regular patrols and Park Mark Award. On your return to Luton Airport, you are in the same spot where your car is ready and waiting for your onward journey. The ultimate convenience leaves you stress free and relaxed at both ends of your journey. On average you can save up to 30 minutes at each end of your journey because you avoid the hassle of finding the car park, finding a parking space, finding the bus stop and waiting around, as well as avoiding any bus transfers. The best news however, is that meet & greet parking is not expensive and you can enjoy this tremendous service for an affordable price! The car park will cover your exit fees for up to 15 minutes. If the driver has to wait longer than 15 minutes you will need to pay £7.00 to exit the car park and this will continue to increase the longer the driver has to wait; please note that this is an airport charge. No transfers are needed, Luton Swift Parking Meet & Greet will be an excellent alternative for disabled customers who would find it difficult to use transfer buses. Your car is collected from the terminal when you leave, and brought back to you at the terminal on return. Please take a copy of your confirmation details with you on your day of travel either by print, or electronic copy. Please note that if your booking carries over the pre-booked return date on your order, the over stay charge is £15.00 per day. Call Swift Airport Parking 40 minutes before the prearranged Meet and Greet meeting on the number provided in your confirmation email. It is important to make this call if you are running late or early. That way our staff will be aware of your situation and assistance will be allocated accordingly. Following the signs for Luton Airport Short Term Car Park. Ignore the signs for Short Stay Car Park Closed. Please call Swift when you arrive in the baggage hall on the phone number provided in your confirmation email, this will give us ample time to ensure your vehicle is waiting for you at the agreed meeting point. We will always try to be flexible and adhere to your needs and requirements where possible. Access to London Luton Airport from the East and A1 is via the A505 dual carriageway through Hitchin. The airport lies just off the A505 and is clearly signposted. Access to London Luton Airport from the West is possible through several routes. If approaching via Dunstable, follow the airport signs. Alternative approaches include travelling via M40/M25 to join the M1 and then exit via Junction 10. Exit the M25 at Junction 21 for the access to the M1. London Luton Airport is only 30 minutes from North London, 15 minutes from the M25 and 5 minutes from the M1. The airport is just two miles from the M1 motorway. Exit the M1 at Junction 10. The route to the airport is clearly signposted.